Thought I would play some 40K this week. My gaming group are still using 6th which is fine by me. 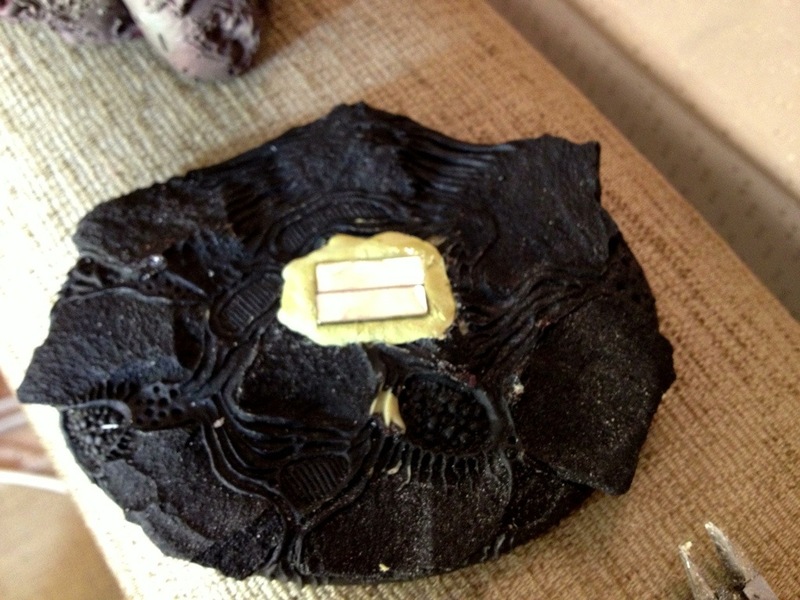 It was also a chance to use a lava-scape gaming mat that I acquired recently. Across the table 1750 of Chaos Space Marines with a Khornate theme. The game was Big Guns with 5 objectives.I got first turn, parked a load of Plague Bearers on the nearby objectives, set the Icon Plague Drones up as my delivery system, and put the Soul Grinders in good positions to Phlegm my opponent. As you might expect from two Chaos forces the action was pretty brutal in the centre of the table. The Drones were destroyed by Kharn and a squad of berserkers although they did get my toads on the board. My Soul Grinders were my most effective unit chipping away at the enemy and absorbing a lot of fire power. My Great Unclean One had a terrible game not turning up until late, mishaping back into reserve and then finally landing well out of the action. Looking on the bright side he did survive untouched and got me the line breaker objective. It was a nice change to play some 40K and it looks like I’ll be playing some more next week as well. At the end of the game I had managed to secure two objectives to my opponents one to take the game. 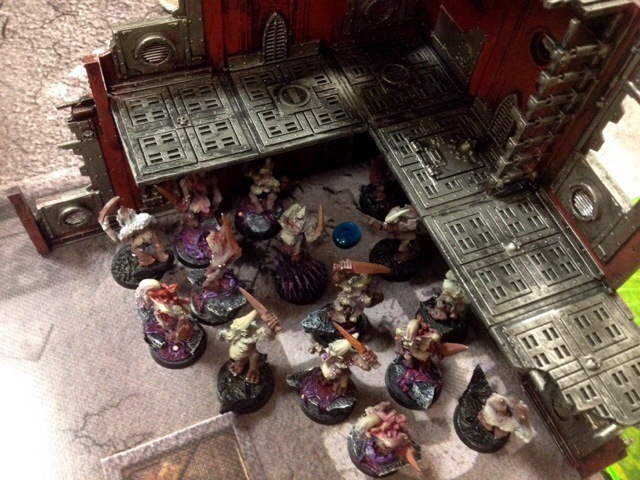 Nurgle Daemons Demolish the Emperor’s finest …. again! 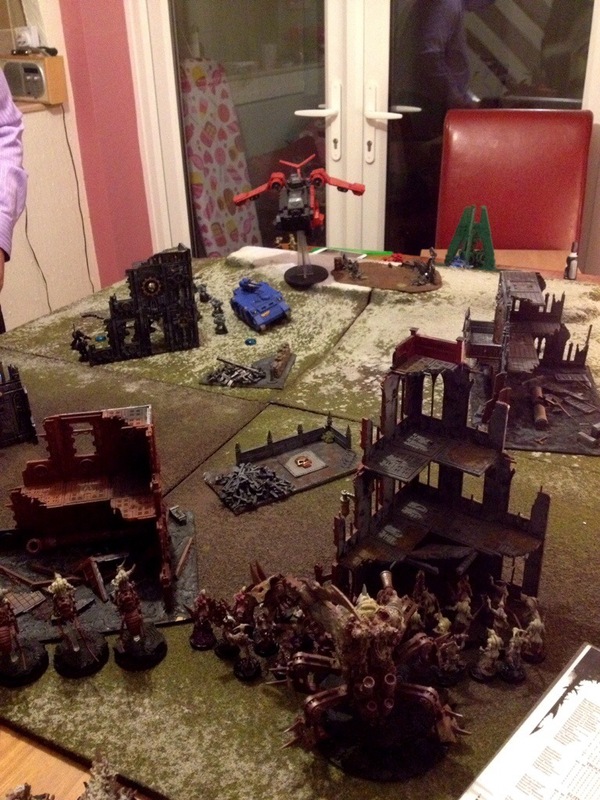 A game of 40K this evening. Space Marines across the table against 1.75K of Nurgle’s rotters. I decided to play the strategy which has worked well recently. Park a medium sized unit of Plague Bearers on an objective, Soul Grinders laying down covering fire, Plague drones getting an icon up the board and Deep Strike remaining units into aggressive positions. 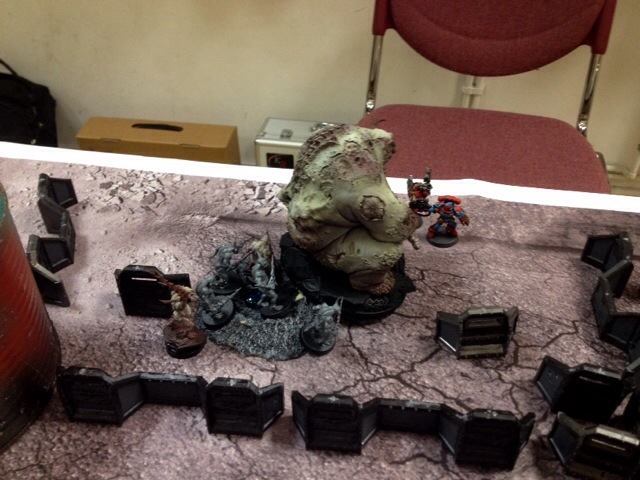 In the first turn I had a stroke of luck with a Phlegm bombardment scaring a squad of Marines off the back edge. Everything else pretty much went to plan and when my Daemon Prince immobilised the Marines Landraider that was carrying a large and dangerous squad it looked like game over for the Marines. 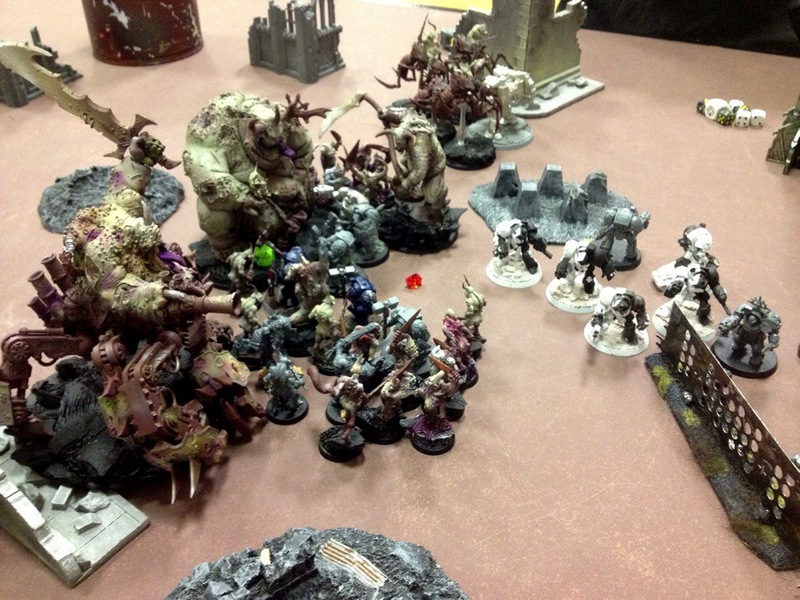 The Great Unclean One joined the battle late but his intervention saw the Daemons claiming an objective deep in the Marines territory. We called it a day and tallying the scores the Daemons had won 11 -3. I’m enjoying the Nurgle Daemons more now that I’m playing more aggressively. I must get the models at least built though – lots of them are falling apart which is a tad embarrassing! A bit of Daemon action on a Thursday evening. 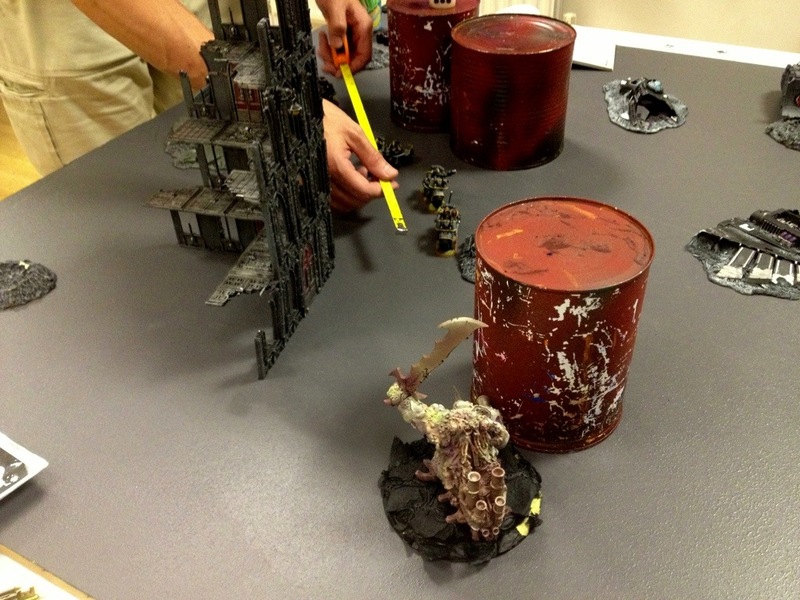 A smallish intro game of 40K saw Nurgle Daemons clashing with Marines. It was a chilled out night of gaming that saw the Emperor’s finest convincing winners. The Nurgle Daemons came out to play again this weekend. 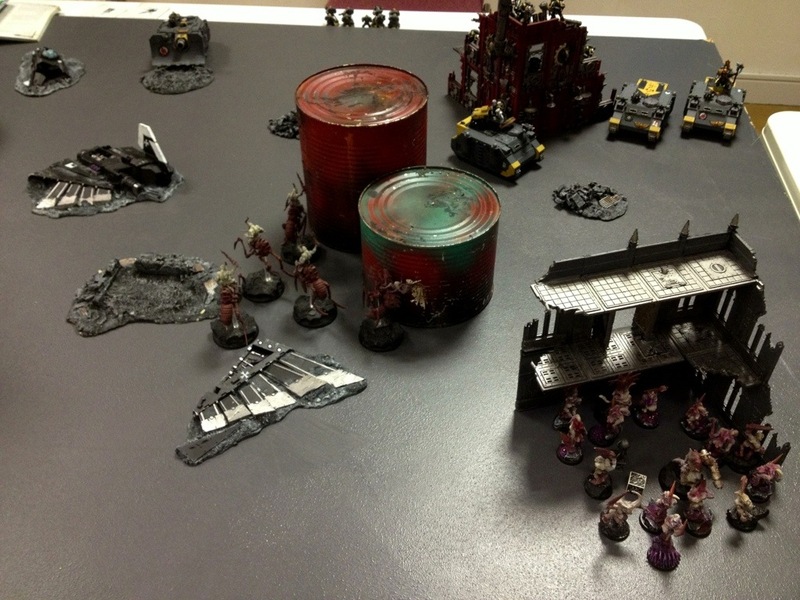 Across the table a Blood Angel force heavy with Terminators. The mission was Relic so I decided to deploy pretty much all of the daemons on the table and simply rush forward to grab the Relic. The Blood Angels seemed to have the same idea so it was going to boil down to a brutal scrap in the middle of the board. The two forces clashed and it was a close thing until the Nurgle Daemon Prince who had been on tank hunting duty got his claws into the Space Marine Commander. 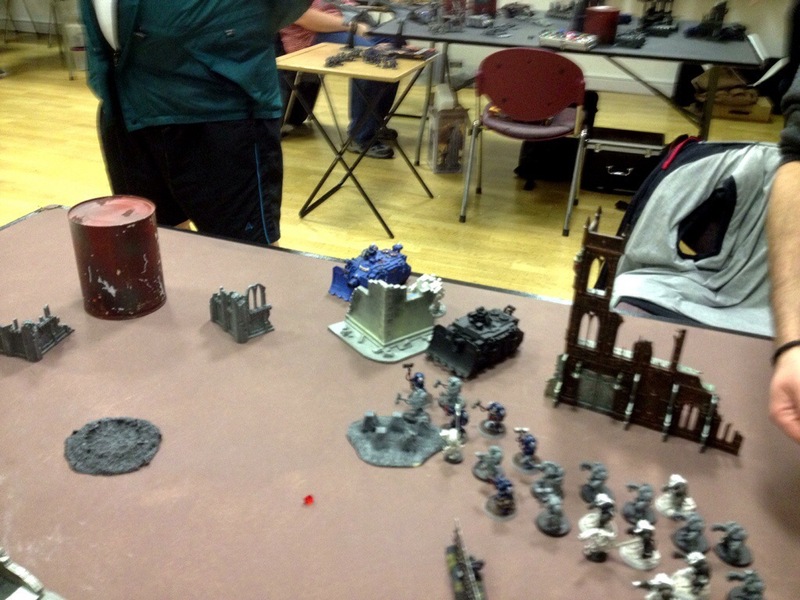 He easily over powered the Space Marine and there was nothing to stop the Daemons taking the Relic for a good win. It was a refreshingly straightforward scrap in the middle of the table. The Terminators were very durable and were having little trouble with my infantry but they just couldn’t stand up to the monstrous creatures. I’m getting more familiar with the Daemons now beginning to feel at ease with what they can and cannot do. Just need to paint the blighters ! A game of 40K this evening. Across the table 1.75K of very nicely painted Red Scorpions. I felt a bit embarrassed as my Daemons are only partially fit for the table and I really must get them up to scratch. Anyway, the game was a good one and although we only played 4 turns each the Daemons were in a strong position at the end. I played the Daemons more aggressively than I have in the past keeping most of them off the table and then striking them in as deeply as I could using the icons. 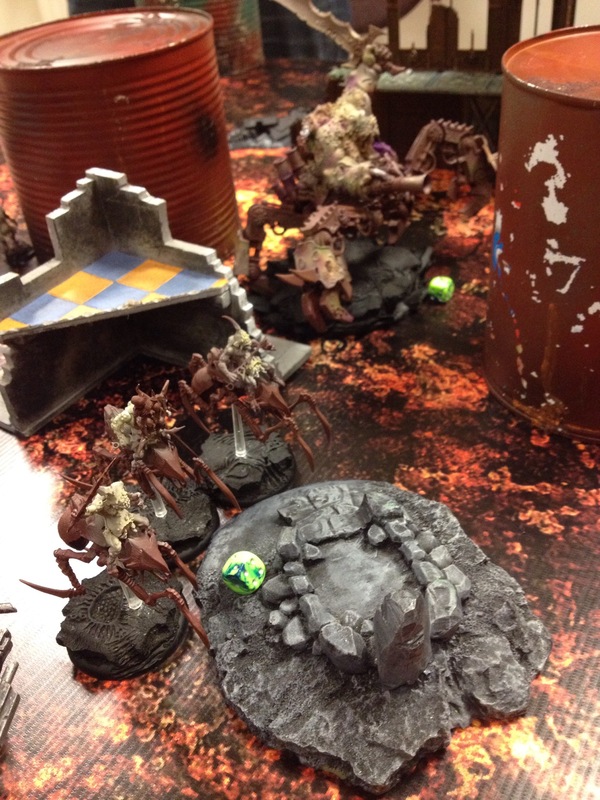 The Plague Drones were the stars of the show and the Daemon Prince I used wasn’t too shabby either. It was good to play 40K again. 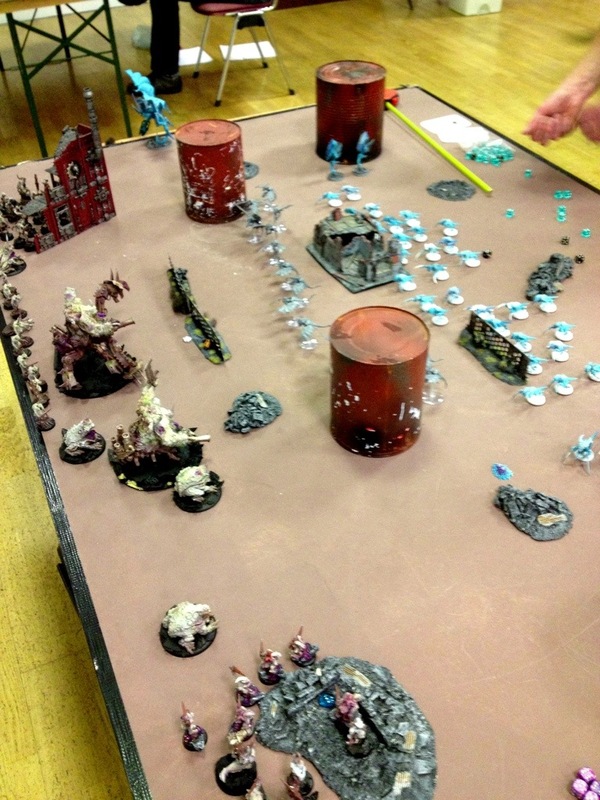 It took a couple of turns to get back in the zone but I did enjoy putting my Daemons out there again. I’ve another game booked in 3 weeks for now so I will endeavour to get the army up to scratch for that outing. 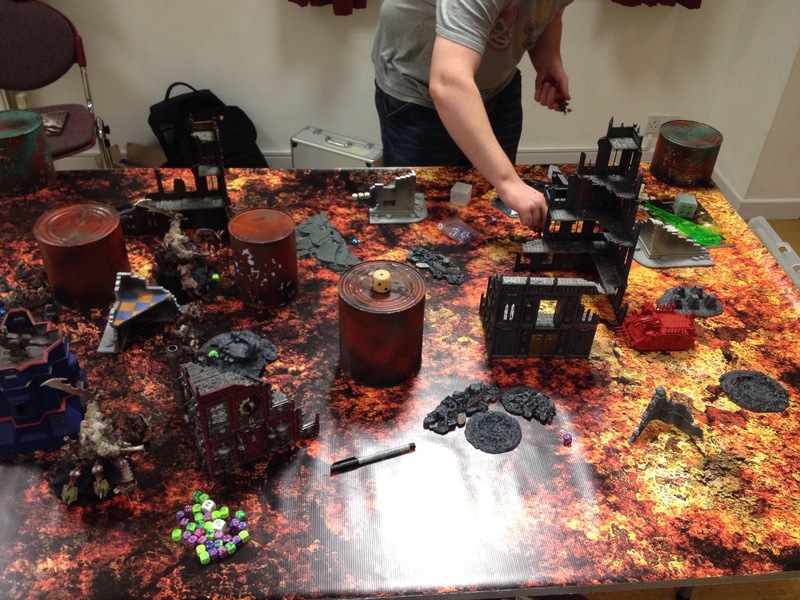 Played a chunky 2K 40K game this Sunday. My opponent played ‘nids, an army close to my own heart but one I haven’t seen much of recently. For this game I went with plenty of Plague Bearers, a pond full of plague toads, a couple of daemon princes and a pair of Soul Grinders. My opponent had a bit of a hoard himself with a Swarmlord and winged hive tyrant leading the way. I camped my plague bearers on my three objectives and basically attempted to weather the storm of the much more mobile ‘nids. My defensive strategy worked to a point. Attack after attack failed to make much impact on the plague bearers, but all the while the ‘nids were in control of territory and when time ran out they had comfortably secured the objectives they needed by being more aggressive. 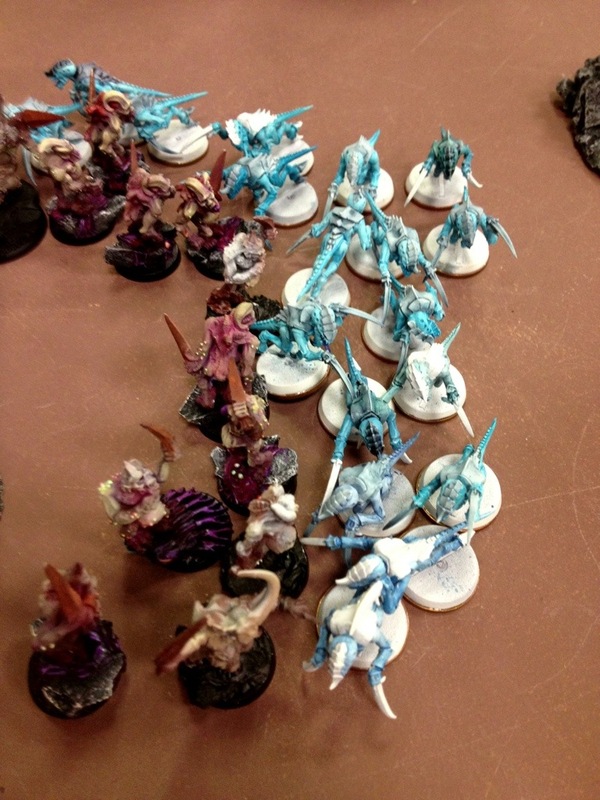 The Daemon Princes were poor in this game – they made almost no impact. The Soul Grinders were excellent again and if I had played the plague bearers more aggressively I think they would have had an impact to. I must remember that even out in the open these guys have a 4+ cover save. A big squad with feel no pain shouldn’t have much trouble advancing on the enemy albeit rather slowly! I also really missed my Plague Drones who give the army a much needed element of mobility. As for my opponent, the Swarm Lord was terrifyingly good, and he deserved the win for aggressive play centred on scoring VPs. I’ll need to be sharper next time! A good night for finishing projects tonight. 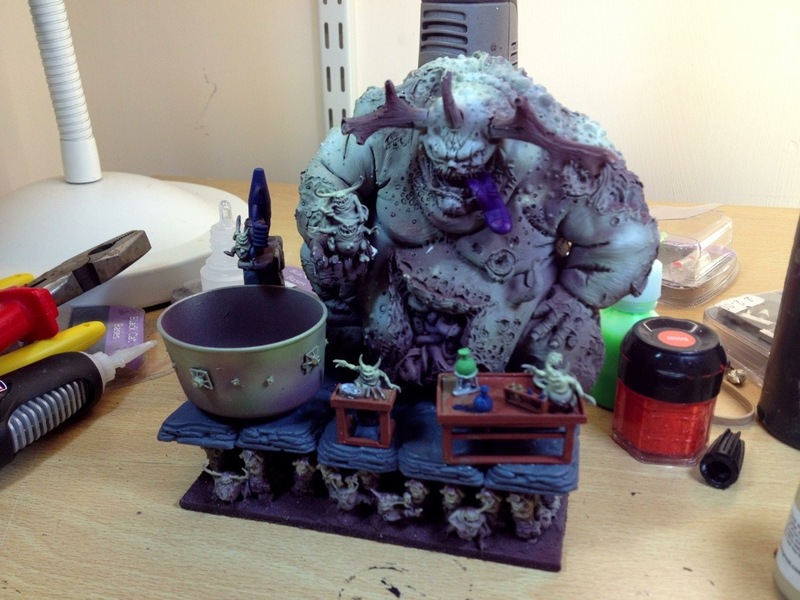 Here we have the final model in my horde of Nurgle daemons – the mighty Ku’ugath complete with portable lab. 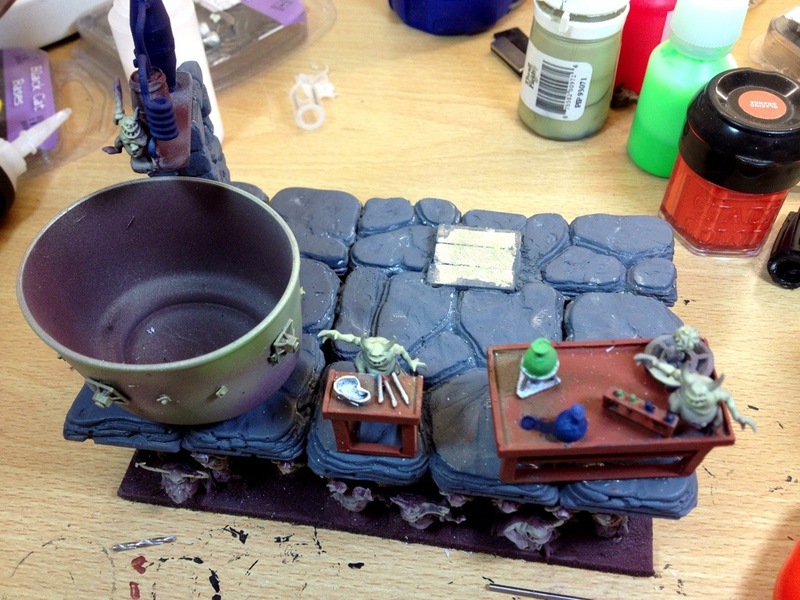 I had a lot of fun putting this conversion together. I’ve magnetised him so he can go on a large oval base and be used as a standard Great Unclean One or he can perch on his palaquin and take on the persona of Ku’ugath himself. So, all the daemons are now constructed and base coated. I’m hoping to paint them gradually over the next few months and find the time to pop them out for a game at least once a month. It would be nice to aspire to get one squad or sizeable monster done for each game but we will have to see how the other labours pan out.